According to Bloomberg, the U.S. government reported in 2016 that an estimated $62 million in pennies are lost each year from circulation. 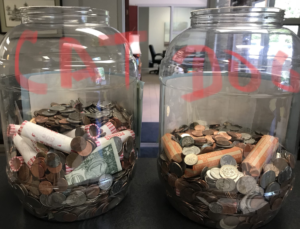 Doing our part to increase the circulation, we decided to have good game of Penny War. For those that are not familiar with this game, each penny is worth a positive point and you place your pennies in your team’s bucket. All silver coins and dollar bills are negative points. You put all the silver coins and dollar bills in your rivals’ buckets. We fought like cats and dogs and raised $462.78. 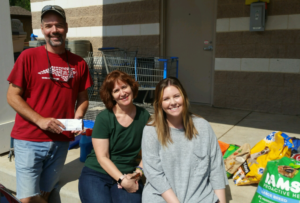 The funds we raised were donated to the SPCA of Wake County. 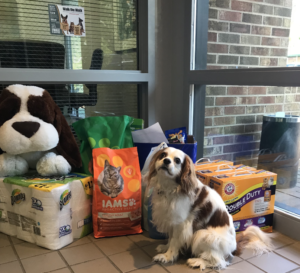 Continuing our love of our fury friends, we conducted a community pet supply drive. Paper towels, liquid hand soap, dish soap, liquid laundry detergent and various other items were collected. You can view the SPCA of Wake County wish list here. 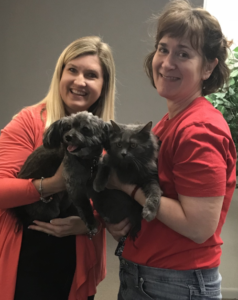 While keeping our pet theme, we started bringing our pets to work on Fridays. Our pets reminded us to pause and take a break from our work. Short walks, a little playtime and temporary distractions gave us a great mental break. Of course this came along with a little laughter too. After we started our Friday pet theme, we find that we are missing something on the other weekdays. We can’t quite put a finger on it, but can you imagine if we could only work on getting that office pet?